I am a little leary of the Dutchman. It does a get job of flaking sails, though. I do not like stack packs unless the pack can be rolled and stowed along the boom permitting the lazyjacks to be stowed at the mast. I love jacklines that can be stowed at the mast. 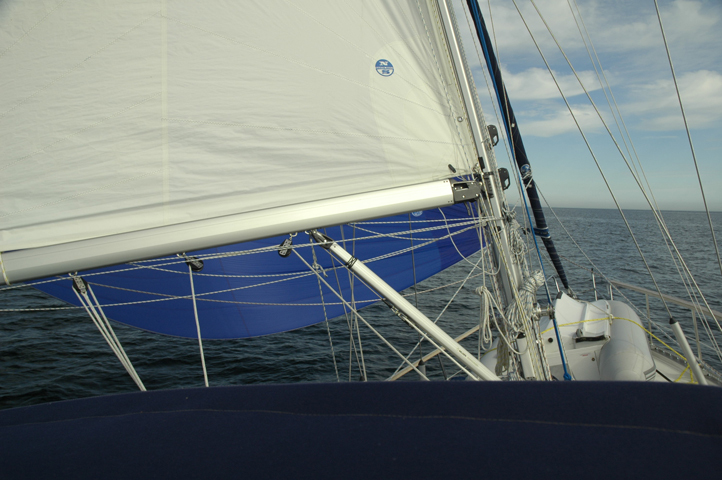 You can use a regular sail cover and the lines will not foul battens. This picture shows the lines stowed. The port ones need to be hardened a little. Is that a symetrical or asymetrical flying? How do you like the ATN Tacker? It is on my wish list. Do you remove the collar or let it stay at the furler drum? All things considered I am a fan of a stack pack/boom bag with integrated lazy jacks. That is a North Sails gennaker with a North Sails tack strap. Fortunately shortly after this picture was taken the owner lost it overboard and bought an ATN tacker. I took this boat (Nauticat 37) around Vancouver Island several times. I do like the tacker. It keeps the tack under control and off the pulpit. We store with the gennaker in the bag attached to the the tack. When you use the ATN tacker, make sure that the snap shackle is attached to the tack. I attach the tack pennant to the ring. That permits you to "blow" the tack if the dousing bag gets fouled. That has happened to me.